Making investment decisions was never an easy task for me. Putting money into anything without thinking about the returns is a daunting task. Moreover, as an investor I have to be careful about the risks involved, too. Since 2014, several big changes have been seen in the Indian economy. It is venturing towards growth as also supported by financial institutions as well with them predicting a significant increase in GDP in the coming years. The Central Bank (Reserve Bank of India) cutting down the repo rate for three times to 7.25 this year. This has resulted in cheaper home and auto loans. This in turn promises a firm foot towards growth of the Indian economy. Also, the government introduced one of the largest national programs, Make in India in order to transform India into global manufacturing hub. With so many initiatives, Indian economy is surely progressing towards growth. 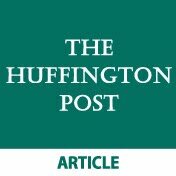 Considering some of the factors and new reforms being introduced, I would like to make investments in a portfolio to maximize my wealth in the long term. Fortunately, this has been made possible by FundsIndia’s New India Portfolio. 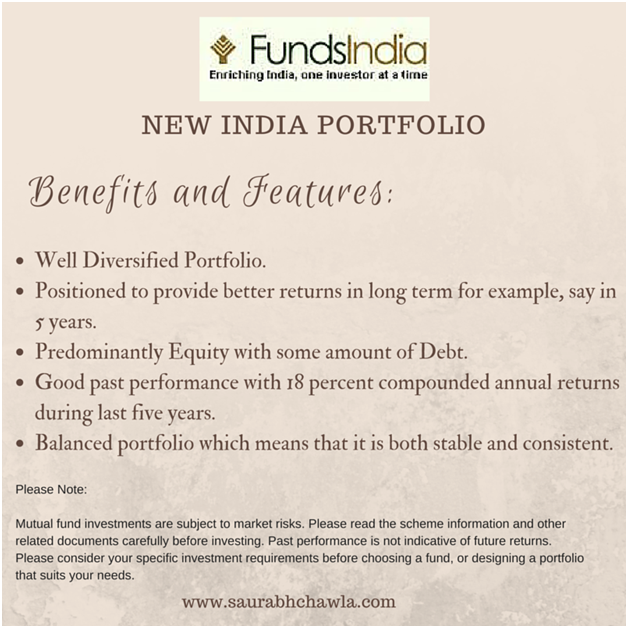 The New India Portfolio by FundsIndia is a portfolio which is build in order to gain from economic revival and easing rate cut scenario. While investing in any fund, two things matter the most – stability and consistency. 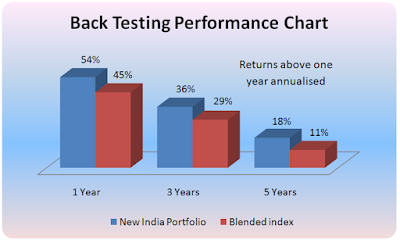 The best part about the New India Portfolio is the ability to provide both. 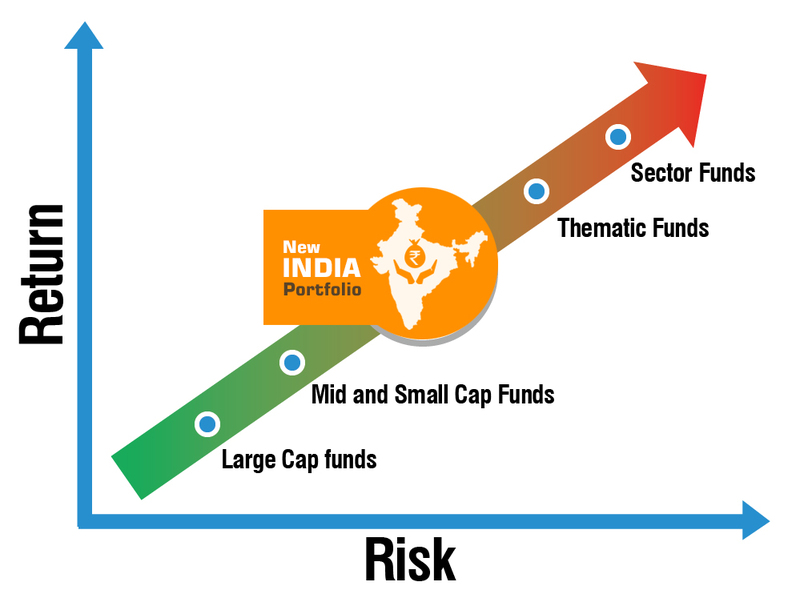 It is a meticulous combination of 4 types of funds which any investor would like to have in his portfolio – A diversified fund, a mid-cap fund, a diversified theme fund and a long term debt fund. I was looking for long term investment goals so that I would be at a profit. The New India Portfolio provides a nice return of 18 percent over a period of 5 years as compared to only 11 percent generated by the Blended Index. 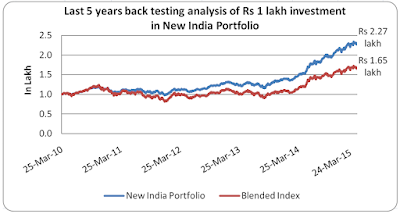 Rather than going to the extreme ends of investing only in large-cap or only the sector funds, I decided that it was better to invest in New India Portfolio which is predominantly equity with some amount of debt involved. It perfectly suited my needs as it is well positioned to provide high returns in the long run; something which I wanted. 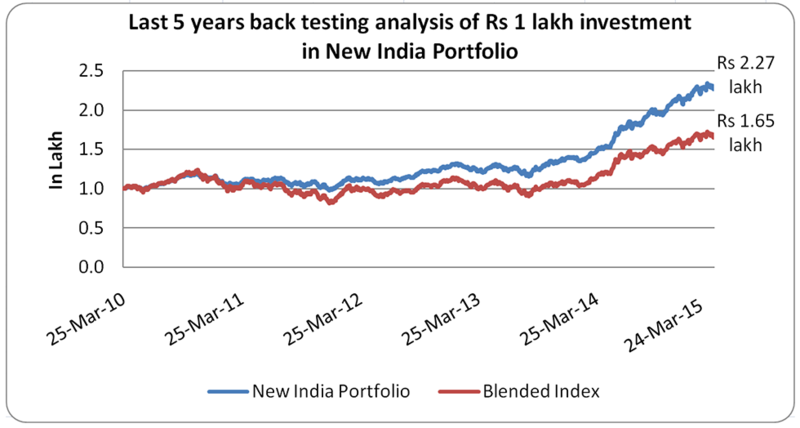 Also, the returns on 1 lakh investments have been significantly higher in New India Portfolio as compared to Blended Index. So, the performance has been no doubt good comparatively. 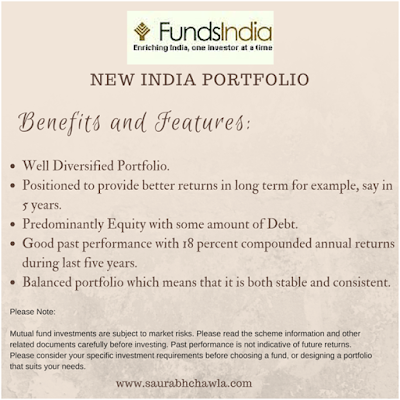 So if your goal is long term wealth gains and you intend to invest in mutual funds, the FundsIndia offers a great, balanced solution for your needs. It is not a portfolio that would give flashy returns but it suited my financial needs. So sign up today with FundsIndia for free and start creating wealth. 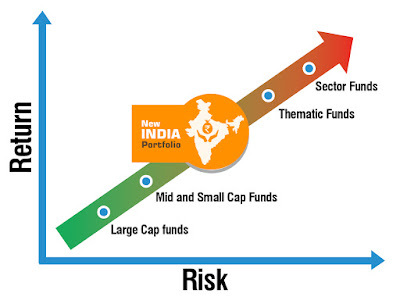 Please Note: Mutual fund investments are subject to market risks. Please read the scheme information and other related documents carefully before investing. Past performance is not indicative of future returns. Please consider your specific investment requirements before choosing a fund, or designing a portfolio that suits your needs.